When & how fast will I receive the money collected from my participants? Learn how long it takes to receive your money and how to transfer funds to your bank account in the payouts page. Once your account is successfully verified, payments can be transferred to your account as soon as they have cleared. Credit card payments clear immediately. Payments from participant's bank accounts take 5-7 business days to clear. Once the funds have cleared, organizers transfer the funds to their bank account whenever they want. They do so by going to the "Payouts" page in the menu on the upper right hand. There, they simply click on "Initiate Payout" and enter the amount they wish to transfer. Once a payout is initiated, the funds are transferred in 2-3 business days. Delay for Identity Verification: When you do your first payout, our payment provider is legally obliged to identify your identity. In some cases, this can delay your first payout by a few days. Please keep this in mind and transfer your funds early enough. Adding a payout method: If you have not added a payment method yet, please see this support article here for USD, here for EUR, here for GBP, here for AUD, here for CAD, and here for ZAR. International Payout: WeTravel also allows you to wire funds directly to any international account. Please see this support article here. 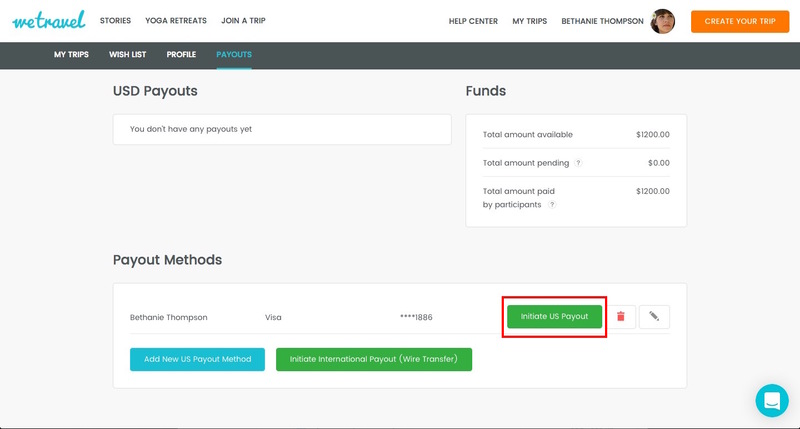 "Initiate Payout" button not available: If you have added a payout method but you do NOT see the "Initiate Payout" button marked above, please contact the WeTravel team so we can verify your account and activate payouts. See here how to get verified for payouts.